So today is Katie's big weigh-in at the vet place. Do you think she'll have as much fun as I do when I go to the vet place? I wonder if they'll coo and squeee and carry her all over the place to meet everyone – everyone who's wearing those armpit-length suede gloves that is! Even though I wish I could go, I'm not due back to the vet place for a long time on account of me being so good at my last visit. The doctor told Glogirly to keep an eye on my weight though. She said that between 6-18 months can be a critical time for kitties and to make sure I don't go overboard on the food. So Glogirly decided to give me my own weigh-in. The Boss would NEVER allow this, but I thought it was really fun. Glogirly used her hand-held luggage scale and our laundry basket. • The scale is really cool. You just turn it on and make sure it reads 0.0 pounds. • It has a strap that you can attach to the laundry basket handle. • Then she weighed the basket all by itself by just holding it up in the air and letting it dangle from the scale. 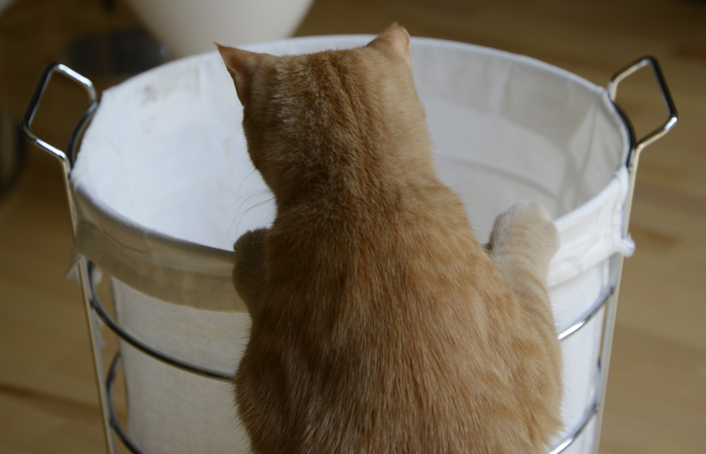 • Next, I got in the basket and she weighed me AND the basket. • So the laundry basket weighs 4.5 pounds. • Me AND the basket weigh 14.2 pounds. • I don't do math yet, but Glogirly says that means I weigh 9.7 pounds. Did you know that I only weighed 3 pounds when I came to live at the Townhouse!? So what do you think the Boss will weigh? We kinda look like we're almost the same size now. But Gloman says I'M a lean-mean-lanky-machine. Go easy on the Boss though...she's already feeling a little puffy, um...I mean fluffy around the edges. Pee S: Glogirly said to make sure you know that this shouldn't replace going in to see the vet place. And the luggage scale is probably not super-accurate. So if you have any questions about your weight or eating or any important stuff like that, you really should go to your own vet place. That's a cool way to get a weigh-in, Waffles. My vet has a scale near the front door and Mom can bring us in and weigh us anytime during business hours. I think you are a big boy! Dood! You're gainin' on me! I'm 14.5 lbs, but I'm going on 5 yrs! How long are you... nose to tocks??? My human got really excited about the luggage scale because she says she knows somebody who really needs one! Um, it is not any of us kitties, BTW. And I don't think it is the dog. The Human fanks Cod she don't live in your house when a being's weight is posted on the Innerwebs for efurryone to see and mock! We hope Katie bares her teefs and unsheathes her 18 sharp swords and threatens to use them if Glogirly so much as types a single number in tomorrow's post. Hmmm, when I want to see what the kitties weigh I just jump on the scale, look,scream, pick up a cat, jump on the scale, look again, scream louder and do the the math. Good luck, sweet Katie! Either way, we think you're purrfect! Waffles, you are going to be a big kitty! You already weigh more than ME!! I weigh 9 pounds, 5 ounces. Glogirly sure made weigh-ins fun! Mommy weighs us with the weighing machine. Her first, then us, some maths and ta-da! Glogirly made that fun with the basket! Mommy just uses the human weighing machine. Waffles, you're a big boy! I think you're going to grow up to be a very big boy! Almost ten pounds and you're not even two, and you're still lanky! Yup, you're gonna be a hunk of a mancat! This is a very good idea. Mom once tried the luggage scale with the soft cat carrier. Using our human scale is not accurate because it rounds off to the nearest half pound, which can make an error as much as 1 lb in the kitty weight. She thinks she will try the luggage scale with the cat carrier ( + and - the kitty) again. Thanks! Waff, you are getting to be a big teenager. We think Katie will weight 10.5 lbs. Psssssst, Katie, I don't think those Vet scales are accurate! What a clever idea!! Mom weighs herself and then (after the screams die down) picks us up and weighs again. Raz is 11.5 lbs! We think that some cats are just born to be lean mean machines like Waffles and out Thomas and some are not, like our Lola Fatola! Mum thinks it's a good idea. We think that as long as we can cross the cat flap, it's OK.
That is such a great idea! We have a baby scale that the head peep bought during the illness of one of the cats who came before, but it's not very accurate, and it takes up a lot of space. We think your method is a lot better... and we would probably agree with using it a lot more than sitting on that uncomfortable thing, too! Passin by from the blog hop to say hi, and to wish you a happy wordless wednesday! ps What a great idea you have there! The mom says she would try to weigh us with her human scale but that means she would hafta weigh herself first...and that's a no go. We think the homemade weigh in was a pawesome idea. Glogirly is so creative and smart. We may try that not to replace vet visits but so Mommy can stop worrying. Tommie went to the vet yesterday and she wants us to monitor his weight at home. Leave it to Glogirly to come up with a creative option. Katie and Waffles look perfect. Waffles, you big boy! You weigh more than Bessie! She is about 8 pounds. If you keep growing then your weight has to follow along so you can be nice and strong. We will keep our fingers crossed that Katie has a pleasant (giggle) visit at the V-E-T this week. Great way to weight a kitty! I just won a luggage scale from Christine Michaels, I am going to have to try this with Cody! This is so cute on so many levels...and measures! 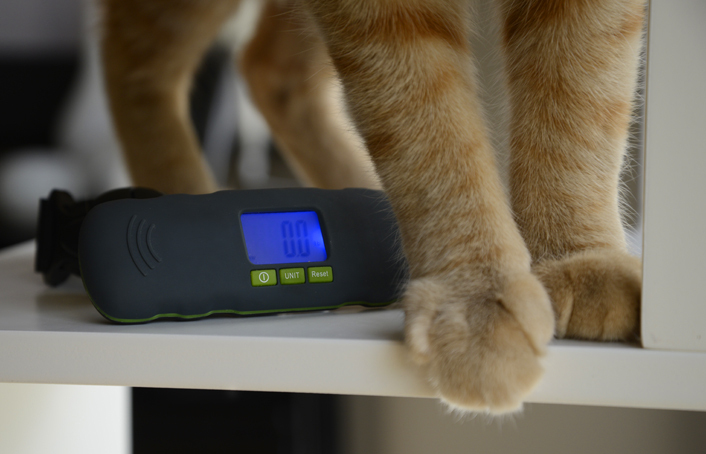 We have a digital postal scale that we use to weigh the cats. 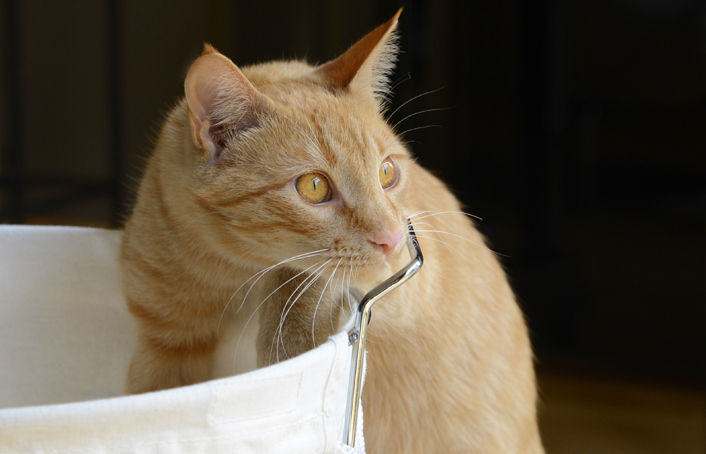 Of course, they still see the vet regularly, but it's helpful to note trends. When we first got Sadie, it was invaluable, as we weighed her every day when she was a wee kitten. That's a great idea for weighing! The nurses and doctors use the long tough gloves with Katie? Cool! I'm gonna tell my Auntie Primrose that 'cause she was thinkin' she was the only one. She's gonna be so happy she has a kindred spirit. Sweetie, you are a wonderful looking mankitty! Don't change a THING! Did you go in the basket willingly Waffles, or did Glogirly have to convince you by putting your favorite toy at the bottom? Jenna is a big cat at 11.5 pounds so you are going to be a big boy! That's a neat idea to do a weigh in. Mama holds us and then steps on her scale. We're all under 10 pounds. No matter how Katie's vet visit goes, she's beautiful to us! Wow that's a cool method you have there, Waffles! We have tried a box on our shipping scales, but even though it's a BOX the kitties still jump out. I like your method better. By the way, you have some truly gorgeous EYES! W2 we bet you had a fun time with your weigh in didn't you? Your eyes are so stunning we love the very first picture with those amber eyes of yours wow! 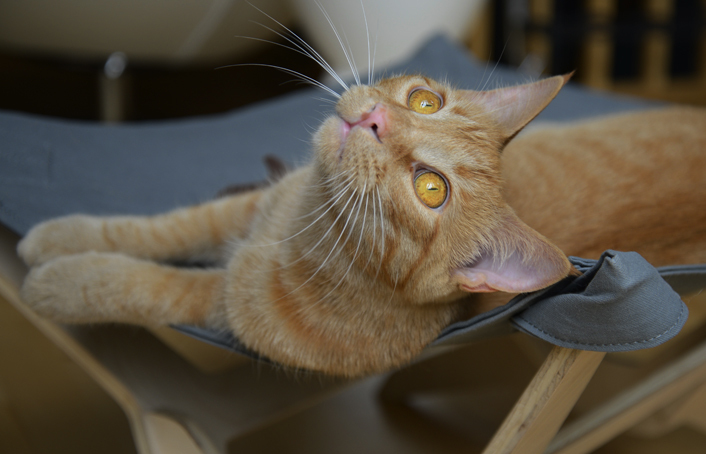 And oh how you remind all of us how our own orange kitty -- Ping. TW used to weigh all her cats by weighing herself and then stepping on the scale holding the cat. Now she's so fat, she hid the scale. Besides I won't let her pick me up. UM, W2 weighs more than I do. Mom says: what Patty Woodland said....especially the screaming part! Waffles, I like the Vet too!!! I walk in on a leash and go straight to the scale for my weigh in. Then when they call us into the exam room I jump onto the table from the floor. I pretty much let them do what they want. Now the little girl in the family is just like Katie. Maybe it's a girl thing. Hope everything goes well for Katie. MOL a super sneaky way to take the guess out of 'Guess Your Weight' machines - right? Ingenious!! !